Fueled by three game comebacks in both the first and second sets, Maria Sakkari upended #3 seed Venus Williams 6-4, 7-6 (2) in the last quarterfinal played at the Mubadala Silicon Valley Classic in San José Friday night. Sakkari lost her first service game in each set, falling behind 3-0 and 2-0 but was able to string together multiple service breaks in a row, including two separate pairs in the second set, to advance to the semifinals Saturday. Williams, who won the tournament in 2000 and 2002, started well, winning each of her first two service games and breaking Sakkari early, capturing 13 of the match’s first 17 points. With Sakkari serving at 0-3, the tide turned for the Greek pro, winning 12 of the next 13 points and five straight games overall to take a 5-3 lead and closed out the first set with a service hold, 6-4. Despite the 10 games played, the first set was completed in just 34 minutes. The second set was more dragged out lasting an hour and nine minutes. Half of the set’s games went to at least one deuce, five of them going more than one, with the third game of the set being decided after 5 deuce points. Again Williams jumped out to an early lead with a hold and break, but then Sakkari responded with a couple service breaks of her own, sandwiched around a hold to take a 3-2 lead. Williams responded with three straight games herself to lead 5-3 with the chance to serve for the set, but was broken at love by Sakkari, and then was unable to capitalize on a pair of set points with Sakkari serving, equaling the set at five games apiece. Sakkari had a chance to serve for the match after breaking Williams at love again, but was unable to hold, forcing a tiebreaker that tilted early in her favor and ultimately went in her direction, 7-2, sending her to her second WTA semifinal of 2018 (Istanbul), and third of her career. Danielle Collins will face Sakkari in the nighttime semi tomorrow after Victoria Azarenka had to retire, 6-7 (4), 3-0. A break in the match’s first game put Azarenka up early, as the two would trade holds for the next eight games. 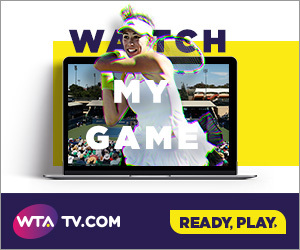 Collins came up with the first of two timely service breaks at 4-5, but was unable to go ahead in the set on her serve, forcing her to win a 12-point game for a second straight break of Azarenka, sending the opening set to a tiebreak, which Azarenka won 7-4. The second set began with Collins winning three straight games before Azarenka was forced to retire with a back injury, advancing Collins to her second WTA semifinal of the year as well. The other half of the bracket will feature #4 Elise Mertens and #5 Mihaela Buzarnescu, the two remaining seeded players in the singles draw. Both players won in straight sets Friday, Mertens beating Johanna Konta 7-6 (4), 6-3, and Buzarnescu over Ajla Tomljanovic, 6-1, 7-5. Buzarnescu will also play in the semifinals on the doubles side, as her and Heather Watson, the #2 seed, beat Konta/Shuai Zhang, 7-5, 6-2. They will take on twin sisters #3 Lyudmila and Nadiia Kichenok. #4 Miyu Kato and Makoto Ninomiya will be in semifinal action on Saturday after a 6-4, 6-2 victory over Priscilla Hon and Georgina Garcia Perez, taking on the top seeded Latisha Chan and Kveta Peschke, who, thanks to a bye and a withdraw, will be playing in their first match action of the tournament.